Serpent Mound, located in Adams County, stretches a quarter mile long and is the largest effigy earthwork (representation of an image) known to this day. Serpent Mound is located in Ohio, east of Cincinnati, off of highway 73 and southwest of Hillsboro. It is on top of a ridge that over looks the Ohio Brush Creek. 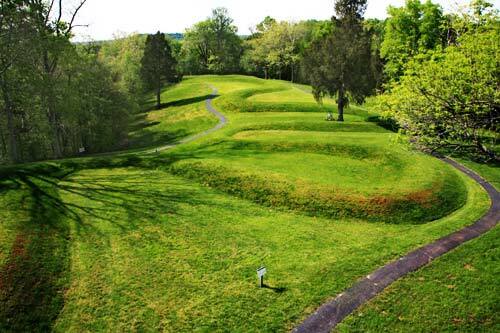 It is located in the Serpent Mound State Memorial and is accessible to the public. Excavations of Serpent Mound found pottery fragments, ashes, burnt stone, and some animal bones, but no human remains. This evidence seems to tie the Serpent Mound to the Adena Indians, but this is open to differing interpretations. Recent carbon dating of pieces of charcoal recovered from the serpent earthworks date back to around 1000 AD, which would post date the Adena culture by almost a 1000 years making it part of the Fort Ancient Culture. However, in 2011, additional studies are being conducted to help better identify the date the earthwork was created. Beginning in early April, 2011, a new archeological research project at the mound is being conducted. The site research being conducted by the Ohio State University, will be using remote radar sensing of the earthwork and will extract small-diameter soil cores from various points in and around the effigy mound to obtain samples of charcoal from an "ash layer" that Frederic Putman of Harvard University's Peabody Museum identified when he excavated portions of the mound in the 1880s. This most recent study will help identify when the earthworks were created. In so doing, archeologists might develop a better idea of the purpose, or meaning of the earthwork. 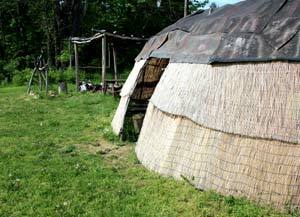 Besides the well-known earthwork, there are also several burial mounds found nearby. These burial mounds were most likely Adena burial mounds created on the site long before the serpent earthworks were constructed. There are several burial mounds around the Serpent Mound that did contain remains. At the park, there is an interpretation center that gives visitors an overview of information known about these prehistoric cultures. The head of the serpent rests on a rocky platform, which presents a precipitous face to the west, towards Brush Creek which is about 100' below the steep cliff that surrounds 3 sides of the precipice where the mound was constructed. The jaws of the serpent's mouth are widely extended as if it was in the act of trying to swallow an egg. When the first surveyors arrived at the site, there was a small pile of stones at the center of the oval which had been burned. The egg is represented by an oval enclosure about 100' long. There were also observed to elevated triangular shaped platforms on either side of what is called the serpent's mouth, but these have mostly disappeared since being recorded in the mid 1800s. This enclosure, as well as the body of the serpent, consists of a ridge of fine earth as determined by excavations and is about 4' high and from 10' - 15' wide. It has also been suggested that the large oval at the head of the snake is not an egg, but represents the eye of the serpent as viewed from the side. Whether it is an eye or an egg will never be known for certain. An early minister who saw the serpent declared that this area must be the Garden of Eden and the snake represented the serpent tempting Eve with an apple in its mouth from the Tree of Life. The body of the serpent winds gracefully back towards higher land, making 4 large folds before reaching the tail. The tail tapers gracefully, and is twisted up into 3 complete coils. The whole length of the mound from the end of the egg on the precipice to the last coil of the tail on the higher land is upwards of 1300' or a quarter of a mile. Description of the earthwork as that of a serpent is controversial. Squier and Davis were among the first to survey the mound in 1848. According to the first surveyors of the area, the shape looked like a serpent with it's mouth open, about to devour an egg and this description gave way to its name we use today. Others have said that it represented the myth of the horned serpent common to many Indian cultures. Ancestors of Indians who lived around Lake Superior said that in their lore, they had removed copper from the horns of the serpent. Could the iconic earthwork represent a map that depicted a water-route back to some large body of water? No one can know for certain. The Serpent mound is the largest effigy mound in the world. While there are several burial mounds around the Serpent mound site, the Serpent itself does not contain any human remains and wasn't constructed for burial purposes. What the mound was built for remains a mystery. Hours vary by season and days of the week. Please consult the Ohio Historical web site for additional information and hours. Serpent Mound was recognized as a National Historic Landmark in 1964. Serpent Mound State Memorial is located about 20 miles southeast of Hillsboro in Adams County.